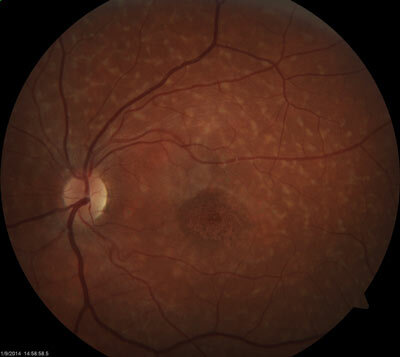 Diagnosis: Early in the disease, the macula may appear normal which may slow the initial diagnosis of Stargardt’s. Children may be misdiagnosed with a psychological vision loss given as the diagnosis. In time, characteristic changes occur in the retinas that help facilitate diagnosis. Fluorescein angiography is a test in which a dye is injected into the arm and the flow of this dye as it enters the eye is studied. The damaged retina sits above a layer called the choroids which is rich in blood vessels that supply nutrients to the retina. During angiography in a patient with Stargardt’s, the damage to the retina blocks the flow of light from the choroids causing a “dark choroid” and this may be used to help diagnosis. This test alone is not considered to be completely diagnostic of the disease. Emotional Impact: Adolescent years are difficult for every child, but imagine suddenly learning that your vision is failing. The sudden awareness to the child and parents that the child is losing vision can be a devastating. The family and the child need to learn immediately about low vision care. Knowledge of the options to help the child can help the family and child put the problem in perspective. Counseling may be needed to help the child through their fears. Support groups or interaction between the parents of other Stargardt’s patients can be beneficial. Decrease of Visual Acuity: Stargardt’s disease may first be detected by a mild loss of visual acuity or sharpness of vision. In the early stages, however, the vision may be near normal. Visual acuity measurements may also vary due to the effects of light exposure and one should not be alarmed if your visual acuity varies on each test. Most Stargardt’s patients have visual acuities from 20/100 to 20/400. A small number of patients will have worse vision. One study of Stargardt’s patients found that all persons tested had decreased visual acuities of at least 20/200 within approximately nine years after onset. Come and Go Vision: As Stargardt’s disease progresses, patients may experience small areas of vision loss or blind spots. As images fall upon the damaged areas of the retina, objects may disappear and reappear causing a come and go effect. Eccentric Viewing: Stargardt’s disease creates central blindspots that increase in size as the disease progresses. Patients learn to turn their eyes in a specific direction to see around the blindspots. They must place the image on an area adjacent the macula. Family members and teachers need to understand that this is an adaptive step used to maximize their vision. Photostress and Dark Adaptation: Children with Stargardt’s disease often complain of difficulty adapting to the dark after sunlight exposure. Light striking our retina causes chemical reactions to occur in the rods and the cones. Our retina must continuously create new photo-reactive chemicals and remove the waste products of these chemical reactions. When a Stargardt’s patient is exposed to bright sunlight, the retina may become bleached by the light and the sharpness of vision may decrease and blind spots may become denser. These are temporary conditions, but can be prevented or lessened by use of sun filters and hats. Photophobia: The damage to the retina also leads to greater internal reflection of light often causing an increase in light sensitivity. Color Vision: Though new theories indicate the damage may begin in rod cells, our black and white vision, surrounding the macula, the condition eventually damages the macular area where cone or color vision cells are. Color vision declines as the disease progresses, but patients usually maintain a significant amount of color vision. The Paradox of Peripheral Vision Sensitivity: Patient may miss or see poorly objects that fall in their central vision, but the far peripheral vision remains intact with Stargardt’s. It is not uncommon not be able to see a face, but notice a piece of lint on the shoulder. Family members often mistake this ability as an indication that the patient can see better than he or she claims. Phantom Vision / Charles Bonnet Syndrome: In more severe stages of vision loss, patients may experience Phantom vision or visual hallucinations. These episodes are not usually related to underlying psychiatric problems, but rather are normal attempt by the brain to make sense of impaired sensory information. The brain may embellish the image making it very real just as it does in our dreams. Depth Perception: Depth perception is dependent on two good eyes. Anything that decreases vision in one or both eyes will cause an immediate drop in our depth perception. Marla Runyan, US Olympian and Stargardt’s patient and the first legally blind athlete to compete in the Olympics.